Throughout this unit, TSW will learn how to quickly and adequately distinguish which point of view is being used. TSW take notes during a teacher-led lecture as well as create their own graphic organizers of the different point of view examples. A community influencer will join the class to read a section of the book ‘Voices in the Park,’ allowing the students to hear four different voices for the four different sections of the book which allows auditory learners to hear and recognize the different points of view. 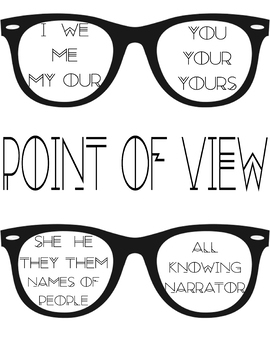 TSW obtain a knowledge of vocabulary words and schema of the different points of view as well as the different roles that play a part in the points of view (e.g.- narrator, bystander, etc.) TSW create their own rap using the vocabulary words in a stimulated online system. TSW also hear a short-story written by the teacher from her perspective. 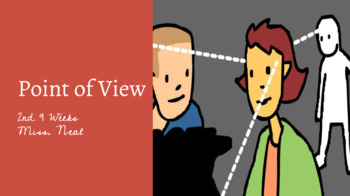 The students will then read perspectives with different points of view from a lawyer and a fireman in groups in which they have to identify the points of view and write an account of the story from the perspective of being a classmate of the victim in a point of view that already has not been used. The unit will end with a standards mastery exam which will formally asses student growth and knowledge.